IPE-NGI devices are designed for corrosion protection of underground steel installations, including those located in the soil with increased aggressivity, and for use as part of UKM-L-NGI type corrosion monitoring systems with remote control and electrochemical protection (ECP) parameters adjustment. Stabilization of total installation potential. ± (0.01UES+0.3) V in installation total potential stabilization mode. (-0.5 – -3.5) V – installation total potential values. Reference voltage, reference current and reference total potential values. Data exchange commands: “3” – “read the logs”; “06” – “make record in a log”; “17” – “read identifier”; “67” – “configuration”. 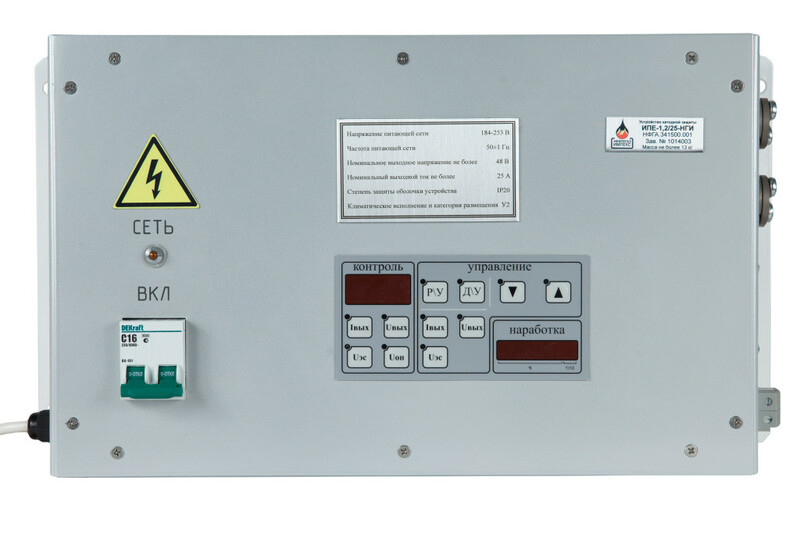 The device operates at output circuit interruption (no-load operation) and restores the load current after output circuit interruption elimination. Dimensions: 404 x 330 x155 mm. The device is given U2 rating according to GOST 15150. The device may be installed in premises with unregulated climate conditions, where the temperature and relative humidity fluctuations do not significantly vary from those in the open air, away from direct sunlight, atmospheric precipitation, wind, sand and dust. Relative humidity: up to 98 at +25 C°.